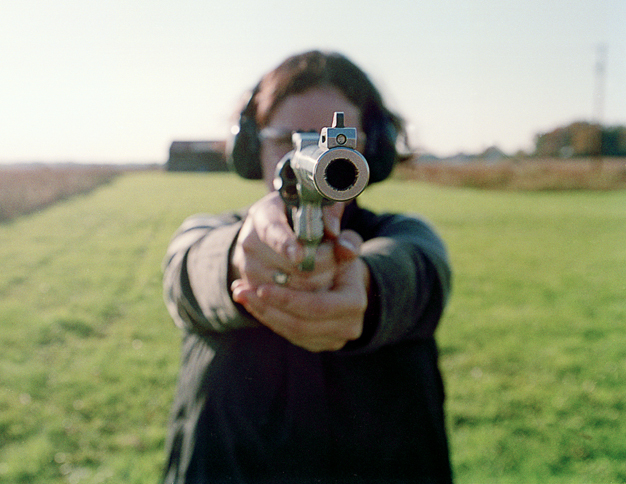 The following images come from Amy Stein’s "Domesticated," "Stranded," and "Women and Guns" projects. Click to enlarge in a new window–but please do not re-use the photos without the artist’s permission. It is said that Amy Stein’s photography “explores the beauty and tension in moments unseen,” that it is an exploration of “our evolving personal isolation from community, culture and the environment.” Stein is a photographer based in Brooklyn, New York. She is the winner of the 2006 Saatchi Gallery/Guardian Art Competition for her series “Domesticated.” Raised in Washington, D.C. and Karachi, Pakistan, she holds advanced degrees in Political Science and a Master of Fine Arts from the School of Visual Arts in New York. She has exhibited nationally and internationally with work featured in publications including Photo District News, ARTnews, Vanity Fair Italia, Smithsonian Magazine and The Washington Post. You can check her out on the web at Amy Stein Photography. Currently she is on location in New Orleans, and it is there that she took the time to speak with me about what she’s working on, her inspirations, the power of an artist and exploring political issues through art. You are currently in New Orleans. What are you doing there? I’m working on a project called “Do You Know What It Means?”, a photo-archiving project funded by The Carnegie Foundation. We’re archiving life before Katrina in New Orleans, gathering archival images, photographs and artifacts to create on online database and website and to also put together a show of the work. What we’re doing is documenting life before the hurricane and flooding, trying to capture the spirit of community, how the streets looked, how life looked in the most devastated areas of the city. It’s a follow-up to a project called “Here Is New York,” a photographic response to 9/11. We’re working with the same gentleman who started that, Charlie Traub, Chair of the M.F.A. Program in Photography, Video and Related Media at the School for Visual Arts in New York. After 9/11, Magnum Photo created a storefront to share images of 9/11, both professional and amateur, and the project grew. People could buy photos, share photos and donate photos–it was a spontaneous community reaction to 9/11. After Katrina, Charles decided to do something similar in New Orleans and create a way for a devastated community to respond to disaster; photography is the tool we’re using to do that. People bring photos and talk about life before Katrina, many non-professionals simply bringing photographs, for some it’s the only thing they saved when they left. So we’re gathering those images, hoping it will amount to a true picture of New Orleans when we’re done. In what way do you think this project has the ability to change the way people live their lives? When I speak to people down here in New Orleans, I often hear them say that they live in the reality of devastation; they’re living in a day-to-day existence of bleakness, crime, fear, and desperation. The suicide rate is up; the rate of depression is up. Thinking about the images we’re gathering, we’re putting together life in one reality and remembering another. Collecting those experiences into one cohesive body allows people, in some ways, to escape their current reality. There is a real value to the gathering of images that affects people at a core level. As a photographer, I’m often on the road working on projects on my own, reacting to culture or society. It’s interesting to guide people on a tour of their own photographic past. How do you develop ideas for a series? What is the creative process like for you? Each series is different, but usually grows out of the last series I worked on. 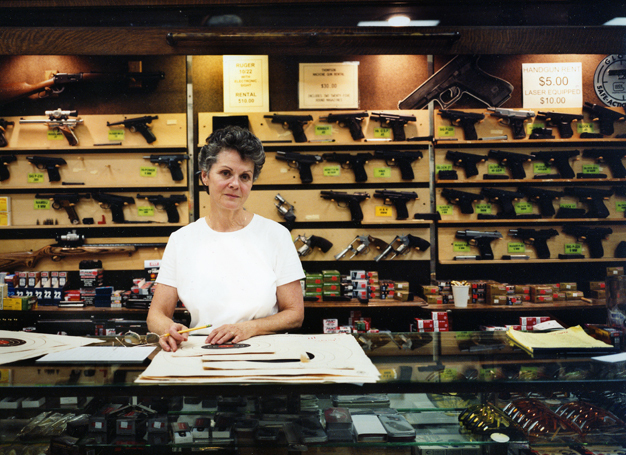 For a while, I worked on a series called "Women and Guns." I became interested because I was working in and around Washington, D.C. at the time of the Beltway sniper attacks, and I became fascinated by the reaction. At the time, you were afraid to go outside. I was working in a small town in Maryland for National Geographic and people were walking around town with guns on their backs. I became interested in guns and people’s relationship to guns in D.C. versus a small town right outside the city. While in Maryland, I became interested in taxidermy and our relationship with the natural world. 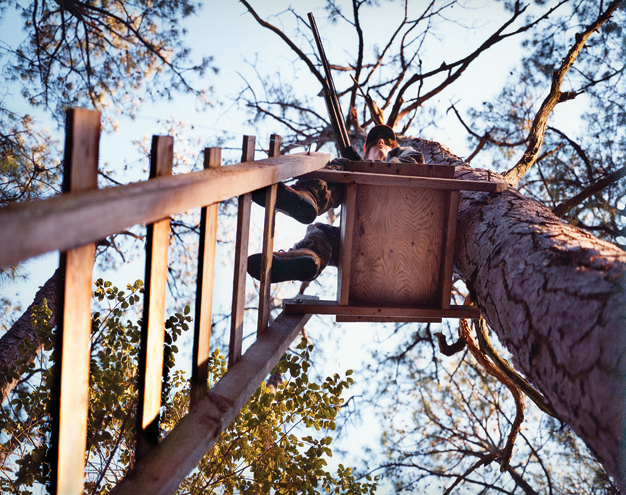 Then, I moved to New York and became more removed from the natural world and that lead to my "Domesticated" series. So one series leads to another. I tend to respond to forces around me. In New York, I was feeling really divorced from nature, feeling that I wanted to do a series where I returned to nature, so I decided to explore my feeling of being isolated. Do you research issues of interest as an idea takes shape? How does that inform you work? I often have an idea, then I read up on the idea, read literature, fiction, newspaper stories or scientific studies about the idea, study illustrations and sketches. From this I start to form in my mind visual ideas. The images in “Domesticated” were inspired by newspaper articles and stories people told me. I tend to react to the world around me. I like to read a lot and distill a lot of what I read. I think about politics a lot and distill that down to my own work. For example, my next series is about mass migrations of animals and linking that to migrations of people. I’m starting to conceptualize that series. I approach the process both logistically and intellectually. I’ve been reading a lot about the immigration debate, while also studying animals that travel en masse to migrate. So there is a mixture of the practical and the fantasy. It seems that ideas continue to grow as you work on a project. 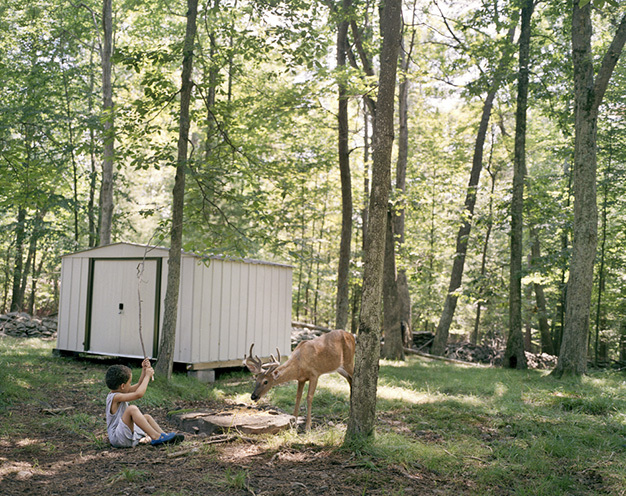 How did you move from the exploration of nature in “Domesticated” to your series “Stranded”? Each series spawns another series. Sometimes the connection is obvious like "Women and Guns" to "Domesticated," but other times the connection is more symbolic, like isolation from society and from ourselves. I always try to work on more than one thing. I work in series, not just photos, wherever I go. I like to think about a series and work on a series that has multiple layers. “Stranded” is about the vulnerability of a breakdown, but also a commentary on living in society and the indifference of others, the distrust among people. In my view we live in a pretty bleak and perilous time post-9/11. The American landscape is becoming more and more homogenous and soulless and that trend is really distressing to me and this is my vision. What I’ve decided to do is photograph the motorists who find themselves stranded. You grew up in Washington, D.C. and Karachi, Pakistan. Talk about that. My parents were in the Foreign Service. We moved to Pakistan when I was two and spent six or seven years there in Karachi, which is no longer what it was; Americans aren’t based there anymore. Then we moved back and my parents worked for the State Department and I came to know other families from all over the world. You have studied political science. How has that impacted your work? I worked in politics, specifically on one of the first political websites, Policy.com. I started photography five years ago and now it’s a full-time thing, which is great. With Policy.com, I lived in New York and worked collecting political content, but then the big Web bust came and I no longer followed the political game on a day-to-day basis. My interest in photography started earlier, though. My mother worked for the United States Information Agency; she ran a photo library with photos from all over the world. I grew up with a huge archive of photos. I was initially interested in the photojournalism side of photography, but soon realized that the content of my work didn’t have to be literal to mirror what was going on politically. For example, “Stranded” is a series of pictures of people whose cars have broken down, but it’s about class, socioeconomic status, race, who has stuff and who doesn’t. Most of the people who break down are those who don’t have nice cars, who don’t have Triple A service. It’s a slice of life, in a way. I will be returning to Texas to take more photographs for this series. I think I’ve gotten to a point where I can work with things visually that aren’t obviously political, but that meaning exists on a deeper level. I like work that is multi-layered and that is the work that people respond to. I think the most successful work people can access on many different levels. Who are artists from whom you derive inspiration? Why? The painter Barnaby Furnas, whose work is influenced by action movies and gun violence, is an influence. 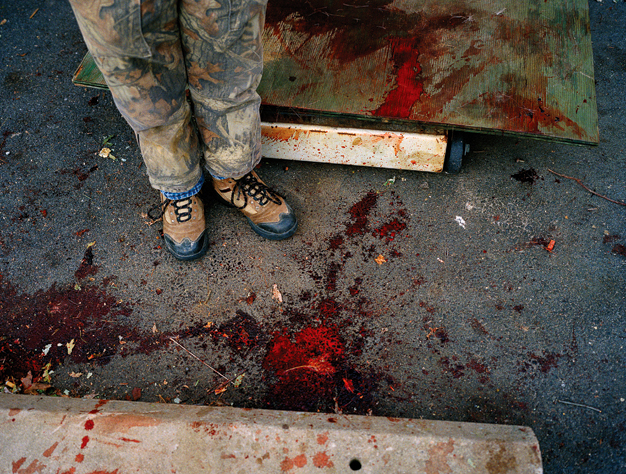 His work is very visceral; it really shocks, there are bullets shooting by and people being blown apart and that is something that I bring to my work. Shocking is too easy, but you want to grab people by the throat. 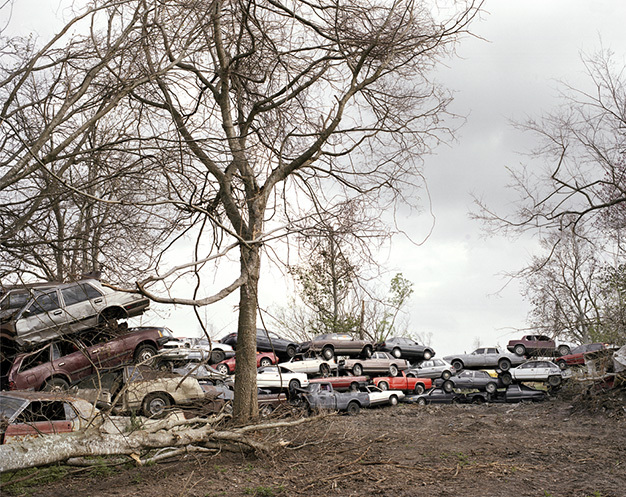 Another influence is Alex Soth. Some photographers are influenced by content, some by work practice. I’m very aware of honing my work practice. I think you can suffer from lack of discipline, logistically and intellectually. He is someone who goes out in the world and works to elevate his photographs to a fine art. I try very consciously for my work to function on both levels. 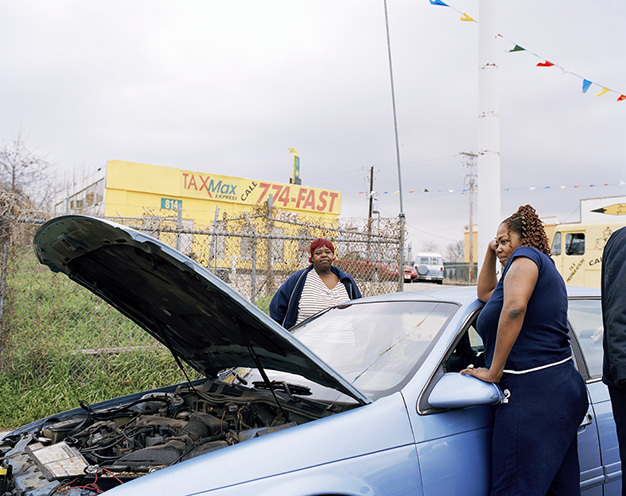 Some other big influences are Gregory Crewdson of Yale and Jeff Brouws, who also photographs life on the road; the American highway is such a huge part of our development as a country. You have said, “As a photographer I am drawn to any discussion of the cultural significance and deeper meanings of color.” Explain that. In my work I’m constantly thinking of color, but not in such a specific way. Color creates mood, visual cues. A lot of color photographers are making black and white photos in color; some of my images fail on that level as well. Though I’m often very concerned with color in my work, I don’t create images with color codes in mind. 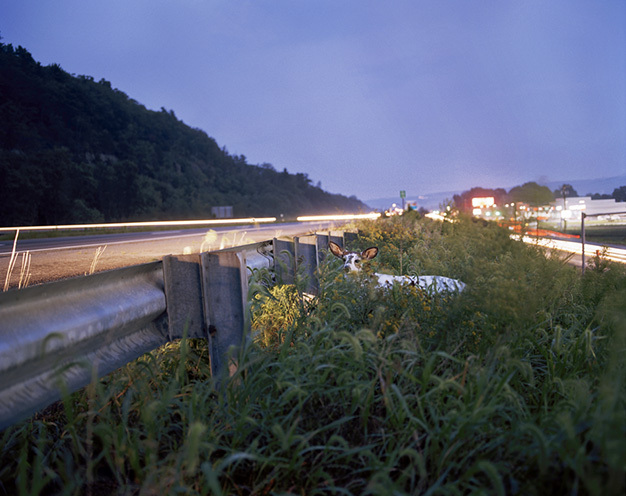 It is something I think about in terms of other people’s work, such as Eggleston, who uses very lurid color, or Jeongmee Yoon, Christian Patterson or there’s Lisa Robinson, whose series “Snowbound” explores white in color photography. There is blankness and stillness in the break from intense colors. Jeongmee Yoon explores how children are color-coded and how those colors play into gender roles, and also explores our material culture, how consumer society is forced upon our children before they have a chance to make decisions. What do you feel is an artist’s greatest strength? An artist is powerful to the extent that our society supports and values art. The great joy is looking at culture and commenting, sharing a critical view; that’s what I feel like I’m doing. It’s hugely therapeutic to share my vision of society and, as I’m showing my work, have people respond to it. Artists have the ability to steer dialogue and debate in the art world. People go to shows or look at books and, hopefully, respond to the work they see by seeing their own lives, culture, and society in a new way that they hadn’t thought of before. We go to art galleries to challenge ourselves in the best sense, and if artist’s work resonates, it can impact culture and society. To the extent work can translate and be accessible, and there are available venues to intelligently discuss work, whether aesthetic or activist works, art can be powerful. What is an artist’s greatest weakness? The market! I think people are greatly influenced by the market and interested in making art that will sell. I find a lot of contemporary art is high on shock value. To have subtle, well-made, provocative art is important to me. Ultimately, can I make the work that I envision in my head? That’s tough. A lot of people can’t translate their vision into something tangible. Getting work out there also becomes an issue. There are a lot more artists than galleries and finding an audience for your work is a challenge. Web sites and blogs are helping to expose new artists to a broader audience, but exposure alone is no guarantee of success. The art scene has become really commercialized, which is great for contemporary artists to sustain their works and make a fair living, but the market tends to be reactionary and rewards work that isn’t smart. This makes me angry because I’m trying to make my work thoughtful with a good physical quality. You hear about people masturbating on paper and people buying that and that makes me upset. I’m sure there is a collector for everything but not letting the market influence the art is a really tall order. I have a studio in Chelsea that I’m never in. My workspace is in my head. I gather imagery to incorporate into my work and carry a notebook. I guess my real studio is in my brain, which is funny because there is a photographer who wants to photograph my studio as part of a series on artist’s space. I create most of my images in my mind, but I make the work while traveling highways, visiting small towns, and meeting people that spark my imagination. If you had unlimited time and resources, what else would you do? That’s a good question! I have so little time. I often wish, if I had the time and talent, to paint and express myself sculpturally. There is an artist, Michael Joo, who explores a lot of the same issues I do. To work in another medium would be a challenge and something I don’t have the time to pursue. I would do more sculptural images. Eric Swenson, a sculpture who also has a lot in common with my work, uses animals and animal forms to talk about society and culture and the death of nature. I’d like to look at other forms of art and incorporate them with my own medium. I have a lot of ideas and not a lot of time. I often have to ask myself, “How can I carve out time to be a better artist and express my ideas potently?” So I would probably also spend more time thinking and sitting and daydreaming and let that influence my work. Some of the best ideas come when I let my brain float a bit. I think my work would improve if I were to tap into that subconscious and let it flow. Posted in Artist Interviews, Visuals and tagged Brooklyn, Photographers, Photography. Bookmark the permalink. Trackbacks are closed, but you can post a comment.